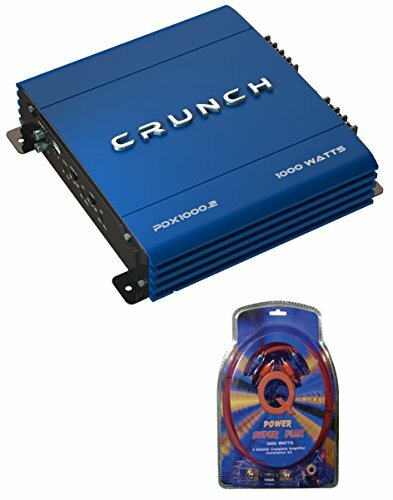 Get more performance out of your entire car audio system by choosing the right amp, the Crunch 1000 Watt 2 Channel PowerDriveX Series Class AB Car Amplifier. This exclusive model comes in stunning blue and includes a 4-gauge wiring kit. Unparalleled in quality, the Crunch 1000 Watt 2 Channel PowerDriveX Series is a low-noise pre-amplifier with low level RCA inputs and outputs. It features flexible installation, allowing the amp to run in 2 channel or bridged mono mode. With rugged MOSFET pulse width modulation power supply, fully adjustable crossovers, and bass boost, this amplifier will always deliver the quality you need. If you want your amplifier to operate at its best you simply cannot use inferior parts and accessories. Our exclusive, pre-selected set of tools includes CopperCure highly conductive copper wires that are oxygen-free to ensure clean and consistent power transfer. These high-performance copper wires are wrapped in the durable and flexible SurfaceFlex wire jacket for effective cable routing. The CRB fuse holder has been specially plated with nickel for corrosion protection against the elements. Last but not least, distortion and external noise are reduced to a minimum with the Strand Interaction Conductor. If you have any questions about this product by Crunch, contact us by completing and submitting the form below. If you are looking for a specif part number, please include it with your message.